The ‘Carbon train’ has already left the station and businesses across the South West had better be prepared for the challenges ahead, argues Simon Ramsay, Associate Research Fellow at the Business School. Curtis Mayfield. For details of the carbon footprint of nylon trousers, please click the picture and use our Show Me The Carbon tool. 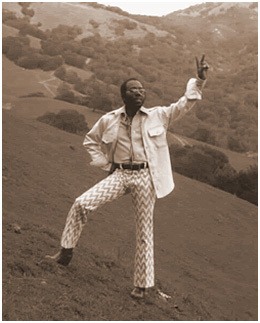 There’s an old and widely-covered Curtis Mayfield song that starts: “People get ready – there’s a train a-comin’…” Originally attributed with heralding increased Afro-American civil rights, the same lyrics may also hold a more contemporary twist: a general feeling that there is some impending revolution heading towards us which, although undefined, feels unavoidable. I’m not referring to the government’s spending cuts, or to the various-letters-of-the-alphabet-shaped recession, but to “carbon” – the word that has been transformed from representing a chemical element talked about in our school classes to a concept that now seems to permeate most things in our lives, from our news headlines to our supermarket shelves. During the last decade, the threat of climate change and the scientific consensus around the need for significant reductions on greenhouse gas (carbon) emissions have grown sufficiently to now be directly informing and influencing public policy at several levels. The setting up of The Carbon Trust in 2001 signalled the start of a more direct attempt by the government to promote a transition towards a ‘low carbon economy’. Since then, the UK has been committed to a long-term, legally binding framework for emissions reductions (with the Climate Change Act in 2008), with a target of an 80% reduction in emissions by 2050. The last few years have seen a relentless, carbon-focused policy activity, with the election of the coalition government further increasing the pressure when David Cameron pledged to build ‘the greenest government ever’. More recently, the Government has launched its Green Deal Energy Strategy; the Carbon Reduction Commitment’s league tables were published and the southwest region was designated as a Marine Energy Park. The changes have not only taken place at a wider policy level, but have also impacted on how the private sector operates. Last year, several leading industry firms (including Pepsico, The Co-operative, Microsoft, BT, AXA and Aviva) started a petition for signatures to urge the government to announce a firm commitment to mandatory carbon reporting. Behind this concerted action was the recognition of the rewards the move could bring to companies taking a lead in the green economy, its role in supporting investors’ decision-making and, above all, the urgent need for clarity and a level playing field for the private sector. A recent report by Defra found that businesses which have been voluntarily measuring and reporting their emissions have been achieving cost savings and better relationships with investors and customers. Mandatory carbon reporting seems, then, only a question of time. The fact is that markets have already started moving towards making carbon reductions. Growing public awareness to climate change, public policy developments and consumer trends are all likely to have contributed, but so have market mechanisms and simple bottom-line business sense, as energy prices steadily increase and the supply of commodities becomes less predictable. Big businesses are now not only looking at just their own emissions, but also expecting reciprocity from their suppliers. In the UK, most of the major retailers are announcing ambitious carbon reduction targets for their supply chains. Tesco has declared an aim to achieve a 30% carbon reduction in its supply chain by 2020 – the company, carbon footprinted over 1,000 products and labelled over 500 in UK stores in 2011. Walmart (owner of ASDA) announced the intention to eliminate 20 million tonnes of carbon emissions from its global supply chain by the end of 2015. Sainsbury’s is committed to reducing its operational carbon emissions, by 30% absolute and 65% relative, by 2020 compared with 2005 – part of their broader target of an absolute carbon reduction of 50% by 2030. Whilst Marks & Spencer’s revised Plan A now includes a dedicated section focused specifically on the reduction of its suppliers’ carbon footprint, listing 33 separate commitments, from energy efficiency targets in its food suppliers to changes in logistics and operations. So what does all this mean to the mainly rural businesses and communities of the southwest? Well, Mayfield’s song only got it half right on this one: “You don’t need no baggage, you just get on board…” The ripples of the change being produced in the public and private sectors are bound to touch everyone so we are all on board this particular train, whether we like it or not. Sooner or later someone will demand to know about your carbon credentials, if not a regulator than a business client or individual customer. When that happens you will need your best carbon trolley case and, packed inside it, the knowledge, skills and capacity to demonstrate that you can engage in the dialogue and address the challenges expected from you. This train has already left the station, and we had all better catch up because, in the words of Mr. Mayfield again: “there ain’t no room for the hopeless sinner…”. Financed by the European Social Fund Convergence Programme for delivery in Cornwall, Clear About Carbon is a four-year project that aims to find new ways to increase carbon literacy within businesses and the public sector. Clear About Carbon works closely with a number of Cornish SMEs and other organisations to determine the most effective methods of communicating the business issues of climate change and the opportunities that a low carbon economy can offer. Delivery of the project is being carried out by a quartet of local organisations: the University of Exeter Business School, Cornwall Development Company, Eden Project and Duchy College Rural Business School. By delivering outreach and training programmes to staff within the county, Clear About Carbon draws valuable conclusions from its work with practitioners. Using these insights, along with qualitative and quantitative research, the project’s findings will be summarised in a report which will aim to inform future policy making at both UK and European levels. This entry was posted in Uncategorized on 15th Mar, 2012 by rwfm201.